Pacing Each online course is divided into weeks. You must complete all of the activities in the current week before the next week is opened. If you get behind, review the Activities List available in each course and make a plan to catch up by completing more that just the required weekly activities. Tracking Your Progress Use the Progress and Completion blocks to track your progress. 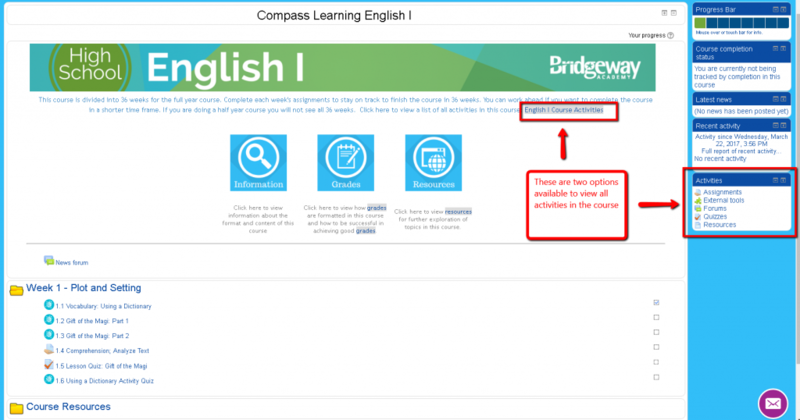 As you progress through the course and complete a lesson, assignment, or quiz, the activity will be marked complete if you met the completion requirements. For quizzes and assignments this means that your grade for that activity was 70% or higher. Learning Activities Learning Activities are interactive lessons that play the role of the teacher in the online courses. Each activity includes several sections; each with a different method of delivery. You will see lectures from teachers, dramas, videos, animations and interactive questions. You should plan to watch the entire lesson in one focused session. Once you start a lesson, you will need to restart if you exit and return. Most Learning Activities include the ability print a lecture transcript. These are generally activities which include a lecture from an instructor. Taking Notes Even if there is a note-taking guide, note-taking is essential to success in the online program. Textbooks are not available; therefore, in order to study for quizzes and tests, it is recommended that students take notes and keep a binder for each subject. The Cornell note-taking method is recommended. Students may print blank copies of the Lecture Notes Form and learn more about note taking by visiting the Bridgeway Learning Center under Contact and Support by clicking on the Online Knowledge Base and searching for “Keys to Success for Online Students”. All notes should be stored in the binder for that subject. Note-Taking Guides Note-taking guides are available to be downloaded in each online core course. Printed copies of the note-taking guides are included with shipments within the U.S. International students will not receive printed note-taking guides, but may download the guides online.